The Centre has, under a mega recruitment plan, sanctioned 15,000 jobs for the youth in the strife-torn Kashmir belt of J&K. The move is being seen as an attempt by Delhi to connect to the unemployed youngsters in the Valley. 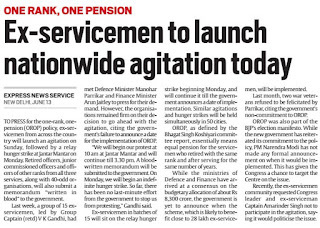 The jobs will be provided in 15 new battalions of the Army, paramilitary and India Reserve Battalions — five each — over the next few weeks, said sources. “The Union Cabinet has approved the scheme. More than 15,000 youth will get jobs in one go, thus making it the biggest recruitment drive in the state in recent years,” said an official. J&K has around 2.2 lakh jobless youth who are registered with the government’s employment wing. The number, however, could be more than 6.5 lakh if those not registered with the employment department too were included, said sources. Such is the enormity of the problem in the Valley that 20,000 youths had turned up at a job rally for a few vacancies in the Army recently. He said the state youth was at the forefront of the successful Assembly elections in November-December last year. “They had become part of the social engineering because of their dream to get jobs,” he said. A string of letters to the Centre explaining the situation and the need for greater thrust on employment was written in January-February this year when the state was under the Governor’s rule, sources said. The job plan could be seen as an outcome of that, they said. Sources said “files have been moving in the corridors of power in Delhi after the Union Cabinet accorded its approval”. “The jobless youth have more been known for their association with anti-establishment protests. The Centre was, on several occasions, apprised of their anger, mainly due to unemployment. The special job drive is sure to provide some relief,” an official said. In a veiled attack on India, Pakistan Army Chief General Raheel Sharif today accused it of “creating instability” through ceasefire violations and supporting militancy in different areas of the country. 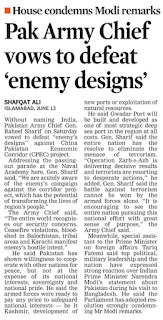 “The entire world endorses our security concerns. 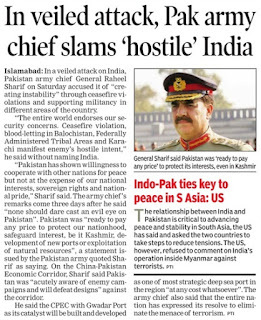 Ceasefire violation and blood-letting in Balochistan, Federally Administered Tribal Areas and Karachi manifest enemy’s hostile intent,” he said, without naming India. 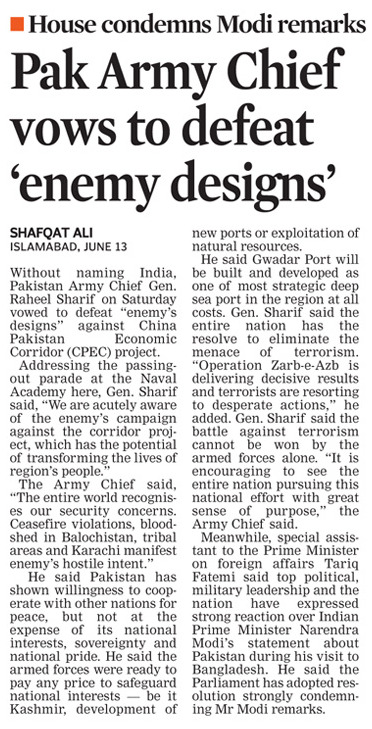 “Pakistan has shown willingness to cooperate with other nations for peace but not at the expense of our national interests, sovereign rights and national pride,” he said while addressing the Naval Academy passing out parade. They are officers, 687 of them, after a passing-out parade at the Indian Military Academy (IMA) in Dehradun today. The 616 Gentleman Cadets (GCs) and 71 Foreign Gentleman Cadets (FGCs) from 11 countries took “antim pag” (final steps) through the portals of historic Chetwode Hall of the IMA. Chief of Naval Staff Admiral RK Dhowan reviewed the parade where 456 GCs were from 136 regular course, 76 GCs from 119 technical graduate course and 84 GCs from 23 university entry scheme. The General Salute was given to officiating Commandant Major General YS Mahiwal and Admiral Dhowan. After congratulating proud parents, Admiral Dhowan asked cadets to remain physically and mentally tough throughout their service besides maintaining high standards of commitment, courage and compassion. “Rigorous training imparted to you has been extremely challenging – both physically and intellectually,” he said. The coveted Sword of Honour was awarded to Ishan Singhal who was adjudged as the Best All-Round Cadet during the training. Ajay Kumar Pathak won the gold medal, while Ashish Kapoor and Naveen Janu won silver and bronze medals, respectively. In the Technical Graduate course and Technical Entry Scheme course, Anshumaan S Bisht won silver medal, while among the Foreign Gentleman Cadets (Maldives), Ali Shareef bagged the silver medal. The Chief of Army Staff Banner was awarded to Hajjipur company for overall standing first in the term. Out of the fleet of 687 vibrant and young officers, 71 Foreign Gentleman Cadets from 11 countries became young officers of their respective nations after showing their immaculate drill skills in the passing-out parade held at the Indian Military Academy (IMA) here today. The Foreign Gentleman Cadets left the IMA with fond memories after completing a strenuous training there. 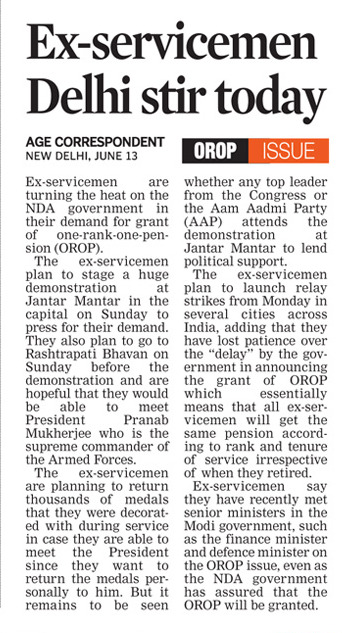 All of them would join the armies of their respective countries as officers once they return home. Foreign Gentleman Cadet Ali Shareef from Maldives, who was adjudged the best all round cadet among all Foreign Gentleman Cadets and awarded the silver medal, said hard work and dedication helped him to excel in the pre-commissioned training. Sharref was awarded the certificate of excellence at the SAARC summit held in Maldives in 2011. Foreign Gentleman Cadet Samsoar Stnakzai from Afghanistan said it was a wonderful experience undergoing training in the IMA. 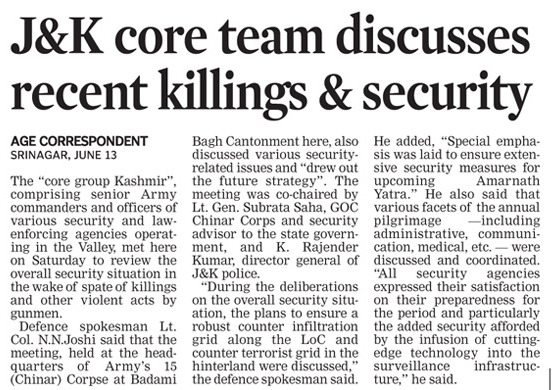 The training would certainly help them to neutralise terrorists in counter insurgency operations in Afghanistan. “The military training gives unique confidence to repulse enemy’s attack, even during adverse weather conditions,” they said. They added that they would share every aspect of training with fellow officers of the Afghan National Army with an aim to eliminate terrorists from their motherland. Foreign Gentleman Cadet N Audu from Nigeria said the training helped cadets to compound criticality of the crisis in all its aspects—physical, mental, moral and emotional. He too wanted to share his skills and experiences with his fellow officers in his country. He ranked the IMA as one of the most prestigious academies of the world as it transforms unskilled and innocent boys into mature and tough army men capable of dealing with any kind of situation. Foreign Gentleman Cadet Kesantia Thobias from Tanzania said every Foreign Gentleman Cadet was given an equal opportunity to exhibit his skills during the training. Foreign Gentleman Cadet Hlalele MJ from Lesotho said they were groomed thoroughly to face any adverse situation in the battlefield. Gentleman Cadet Abheesht Dwivedi, a former NDA cadet who was among the passing-out cadets, said Army officers had the unique combination of confidence and physical and mental stamina at a young age to lead the men even under adverse circumstances. “It is a very special day for me and my family members. I have worked day and night to accomplish my dream,” he said. Dwivedi hails from Kotdwar tehsil in Pauri district, Uttarakhand. 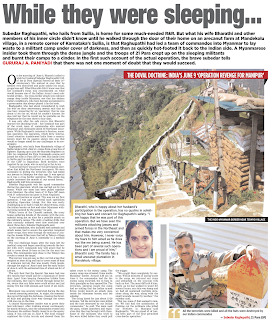 Abheesht’s mother Chandrakala Dwivedi, and father Veerandra Dwivedi felt proud that their son was joining the Army. He said his parents were government teachers and they always motivated him to join defence forces. Gentleman Cadet Tarun Rai, son of serving Wing Commander SK Rai who belongs to Gajipur in Uttar Pradesh, decided to join the Indian Army as his father is serving in the Indian Air Force while his sister is serving in the Indian Navy. He said the best part about Army officers was that they lead men even in adverse situations and sacrifice their lives, whenever required. Senior Under Officer Ashish Kapoor, a farmer’s son from Kurukshetra, Haryana, was awarded the silver medal. He is an alumnus of Rashtriya Indian Military College (RIMC), Dehradun, and the National Defence Academy, Pune. He said passing out from the portals of the IMA was like a dream come true for him. Sharing similar sentiments, Gentleman Cadet Wasif Majied, who hails from Daru tehsil in Anantnag district of Jammu _and Kashmir. 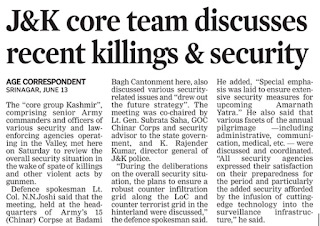 He is keen to face terrorists in the Valley when he joins _his battalion. If power is perception, propaganda is the perpetration of perception. 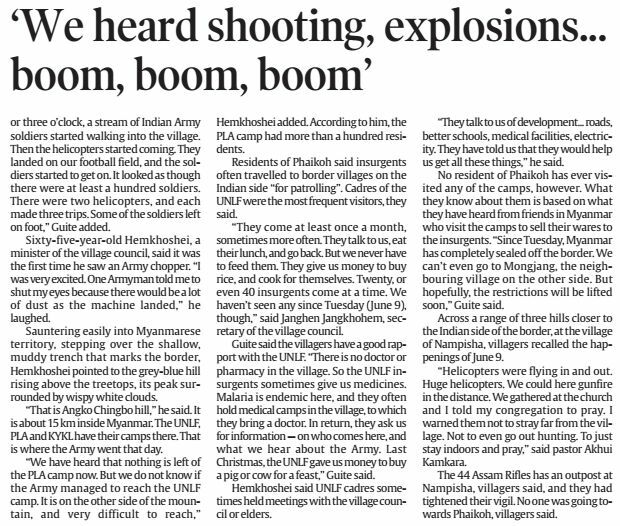 The Indian Army’s cross-border operation against Northeast militant groups operating deep inside Myanmar forests is unravelling from the initial surge of national pride to controversies raging in the media. One TV channel on the day after the operation said the bodies of over 100 ultras were found killed by Indian troops. The next day, they brought it down to around 50 and now its down to seven or 10. 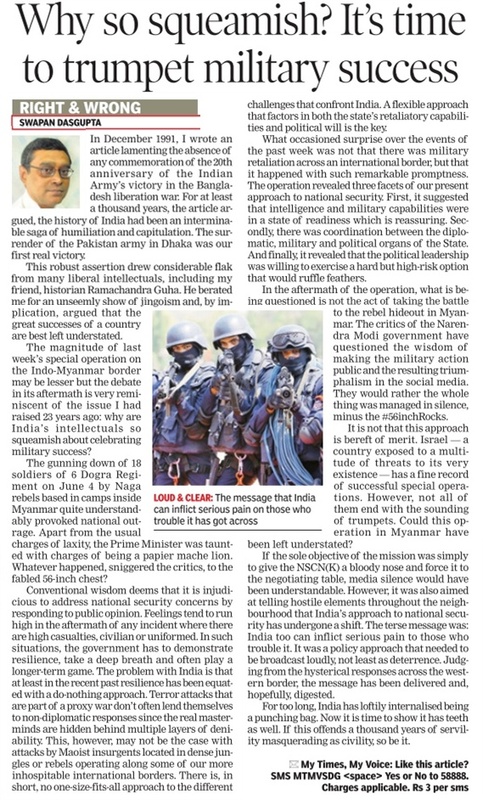 But none in the media, in their passionate search for ‘truth’, realised the significance of the mission. 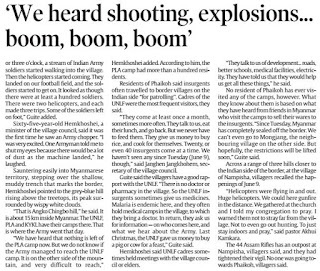 What has been missed in that search is that the Indian Army never gave out the numbers killed. Its communique merely mentioned that an operation was carried out and they did not have the time for a body count. 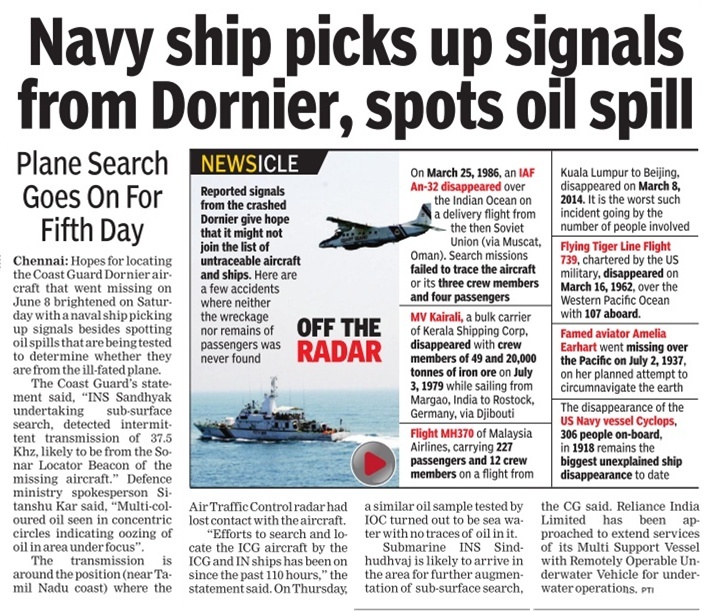 It is not the numbers that matter, but the signal sent out to those who are actively trying to destabilise India’s geopolitical interests, like China and Pakistan. China has been actively funding militants, alarmed by Modi’s developments plans for the Northeast. The op also provoked Pakistan, the father of terrorism and crossborder attacks, to warn India that it was not Myanmar, hinting that any such action would face retaliation. 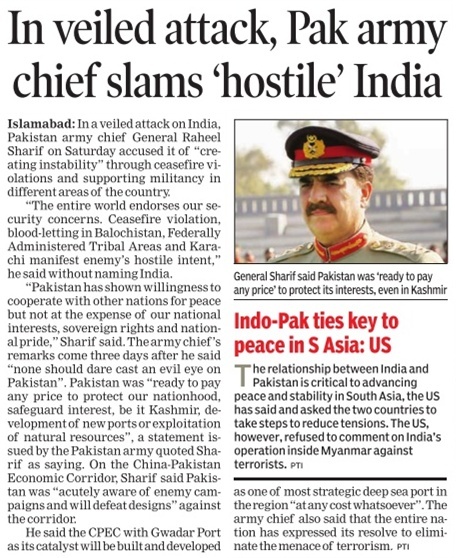 It was a tacit admission that Pak is sheltering anti-India terrorists in militant camps across the border and in PoK. 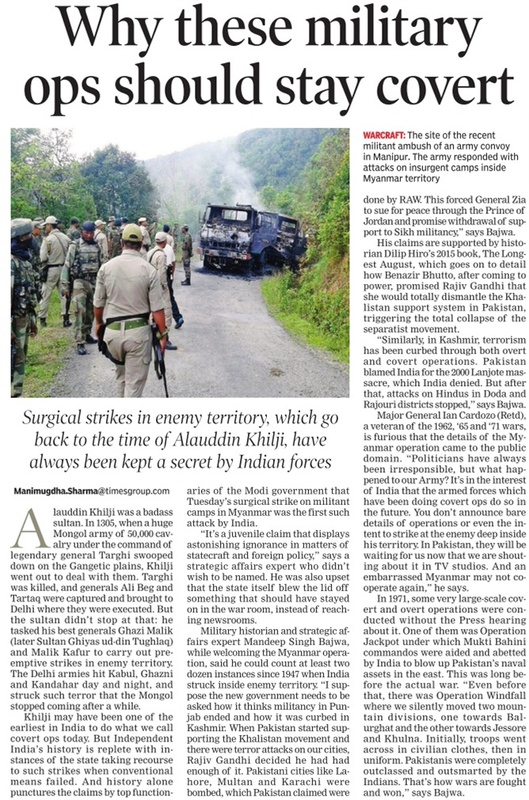 This is not the first time that Indian commandos have moved into Myanmar to strike against rebels. 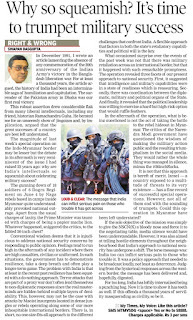 In the mid-1990s, when insurgency in the Northeast was at its peak, India and Myanmar signed an MoU in 1995, following which the armed forces of both countries conducted a joint military operation, ‘Operation Golden Bird’, named by someone with a grim sense of humour, after a Grimm’s fairytale. In January 2006, India and Myanmar conducted joint military operations inside Myanmar against the Khaplang group, which executed the Manipur attack. 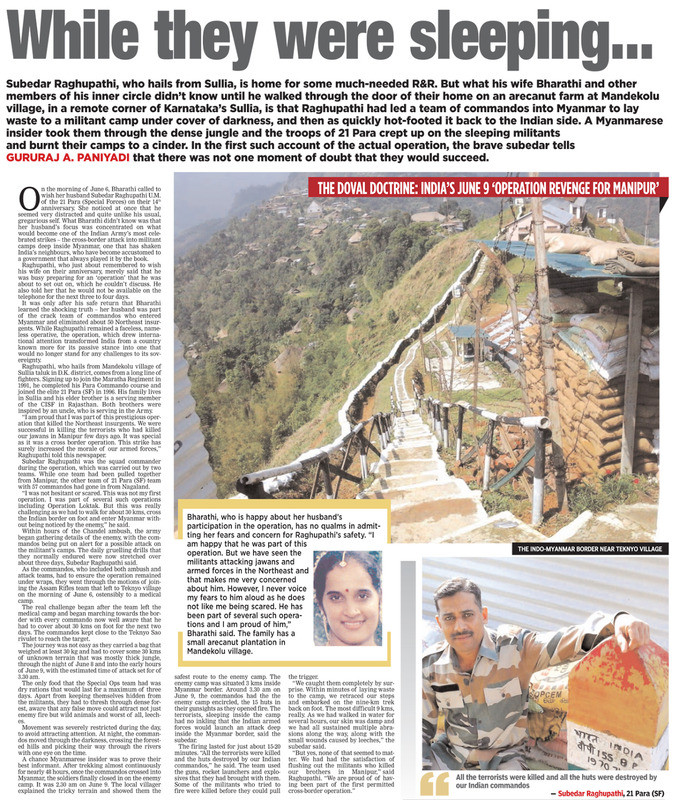 In 2003, ‘Operation All Clear’ was conducted inside Bhutan—when the NDA government was in power—against North-eastern ultras, destroying 30-odd militant camps and killing 650 insurgents. 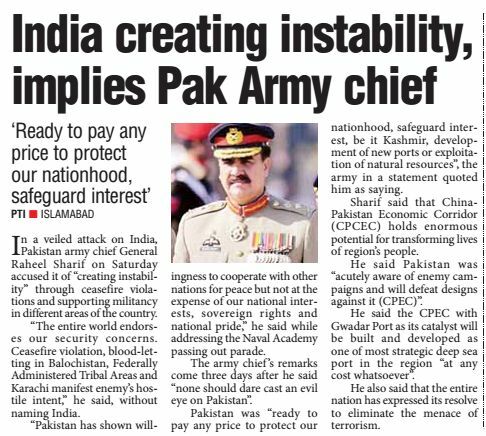 When the Pakistan Army in a cross-border incursion beheaded Indian soldiers in 2013, all the UPA government did was to dither. 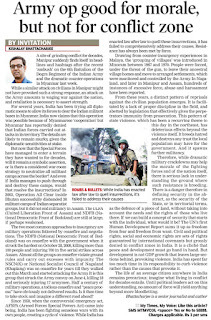 Even when Kargil was taken at Musharraf’s orders—partly due to army intelligence failure—the NDA government struck back and reclaimed its territory at the cost of many Indian lives. 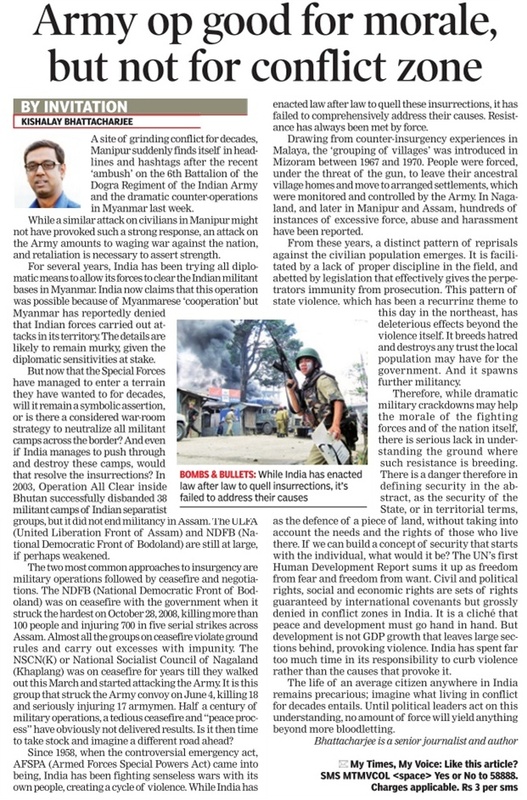 Right now, the effort by the anti-NDA forces is to scuttle the government’s anti-terror resolve by discrediting the Indian Army’s Myanmar operation. An unsourced photograph of Indian soldiers standing by a helicopter claiming to have participated in the attack surfaced in the social media. The allegation that the whole op was a political stunt since militants would have heard the chopper and fled is gaining currency, especially with talk show hosts. A nationalist act of retribution is now being converted into a political circus. 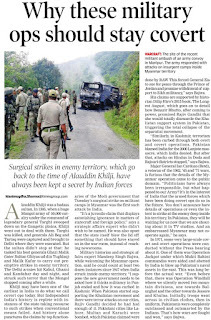 Ever since the Gen. V K Singh resignation episode and the disbandment of the Technical Services Division—the Army’s only counter-terror organisation—the internecine politics in the forces is at the highest level. The politician-bureaucrat-arms dealer nexus had brought much shame to the reputation of our forces. The controversy over the Myanmar op targets people like Defence Minister Manohar Parikkar, who are pushing for transparency in the defence sector. Lieutenant General HRS Kalkat, who commanded the IPKF in Sri Lanka, had famously said, “India should leave its Burma policy to the Army. We are soldiers, they are soldiers and our blood is thicker than the blood of bureaucrats.” The Army has paid its share of blood and spilled the blood of India’s enemies in told and untold battles. Let’s give our soldiers their due, irrespective of the numbers killed. Or else we are dishonouring the memory of the 18 jawans who were killed on June 5 as well as the hundreds who have died in Kashmir. The message that India will strike back cannot be condensed into a numerical argument using a political and media pocket calculator. Academy Cadet Adjutant (ACA) Ishan Singhal, son of serving Brigadier Anoop Singhal, was adjudged the best all round cadet of the passed out course and was awarded the coveted Sword of Honour. He would join the regiment, which his father is commanding, as he had asked for the parental claim during dissemination of arms and service for the passed out course. ACA Ishan told The Tribune that winning the Sword of Honour in the Indian Military Academy was like a dream come true. “I have worked very hard to achieve it. Respect and pride encouraged me to join the defence forces. My father always motivated me since childhood to don olive green,” he said. Ishan said joining the Indian defence forces was one of the best ways to serve the nation. He urged youths to come forward in a large number to join the Indian Army. Battalion Under Officer Ajay Kumar Pathak was awarded the gold medal for standing first in the order of merit in the passing-out parade. He said serving the Army was a passion not a profession. He was feeling proud that he had joined this noblest profession and asked the youth to come forward to join the Army. Junior Under Officer (JUO) AS Bisht, son of Col CS Bisht who won the silver medal, had done schooling from a private school in Dehradun. 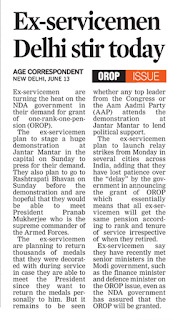 He said Uttarakhand had the distinction of sending the maximum number of youths to the Indian defence force. His father was his role model, he added. Battalion Under Officer Naveen Janu, son of Brigadier Bharat Bhushan, was awarded the bronze medal for his extraordinary performance during the pre-commissioning training in the Indian Military Academy. He said since childhood, he wanted to join the Army as his father is serving it as an officer.